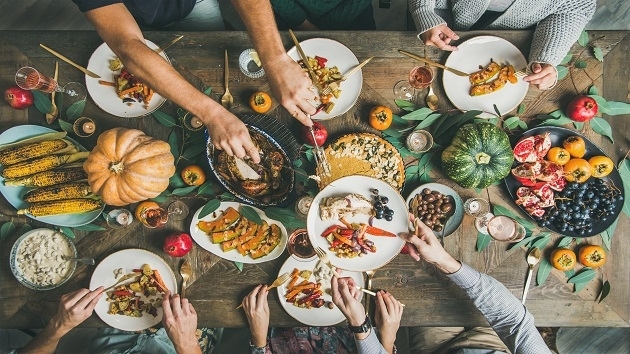 (NEW YORK) — Before making a Pilgrim sandwich or a turkey pot pie, be sure to check guidelines for the fridge life of your favorite Thanksgiving eats. Here’s how long your leftovers will last in the fridge, freezer or both, according to the U.S. Department of Health and Human Services. Lasts four days in the fridge. Four months in freezer for best quality — after four months it can dry out and lose flavor. How to store turkey: Cut leftover turkey into small pieces and store separately in small containers. Up to four days in fridge. Up to four months in freezer. Reheat gravy by bringing to a rolling boil. Cover to heat all the way through. A week to 10 days in fridge. Freezing not recommended. Refrigerate after opening. Lasts one to two weeks. Freezing not recommended. Four days in fridge. Up to two months in freezer. Up to four days in fridge. Two to three months months in freezer. Fruit pies can be kept at room temperature for two days, according to Bettycrocker.com. They can then be stored in the fridge, loosely covered, for up to two more days. An unbaked crust will keep for two months in the freezer, while a baked crust will keep for four months. Refrigerate all leftovers within two hours at 40 degrees Fahrenheit or colder. Leftovers should always be reheated to 165 degrees Fahrenheit.